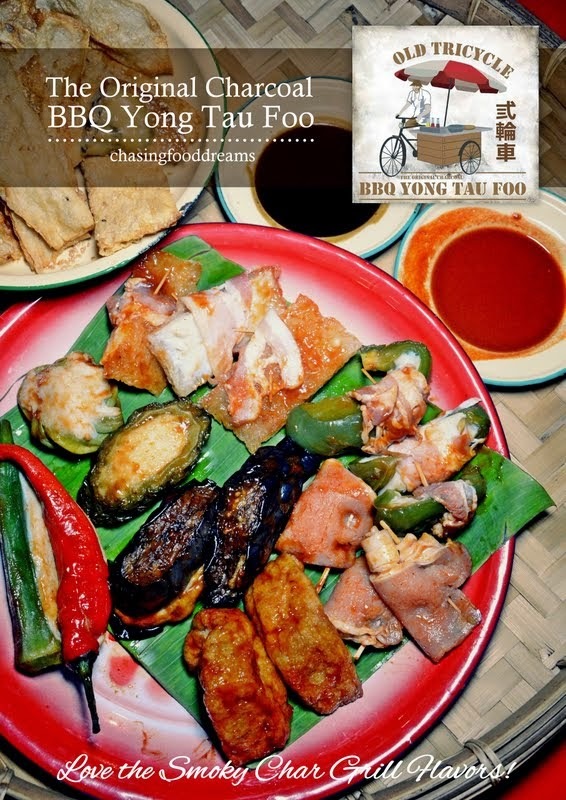 CHASING FOOD DREAMS: Old Tricycle Yong Tau Foo, Taman Desa: Yong Tau Foo with a Smoky Twist! Old Tricycle Yong Tau Foo, Taman Desa: Yong Tau Foo with a Smoky Twist! I love Yong Tau Foo… its simple street food like this that never fails to satisfy my tummy in times of hunger pangs. I even admit to eating yong tau foo at least once a week simply because it’s cheap, easily available and delicious with its choices of vegetables or soy stuffed with a minced filling of fish paste, pork or both. Of course, there’s the partner-in-crime, the long thin slivers of rice noodles or Chee Cheong Fun that is splashed with various sauces to go with the yummy yong tau foo that makes this street food even more delectable. With all that said, I heard about the latest grapevine that there is new age yong tau foo that has been smoking up Taman Desa literally. Old Tricycle Yong Tau Foo in Taman Desa is serving up their creation of yong tau foo grilled over charcoal. It started with the owner, Mr. Ray’s father who has been serving up traditional yong tau foo in his tricycle stall under the name of Choon Kee at Pudu for more than 55 years before Ray took over now. 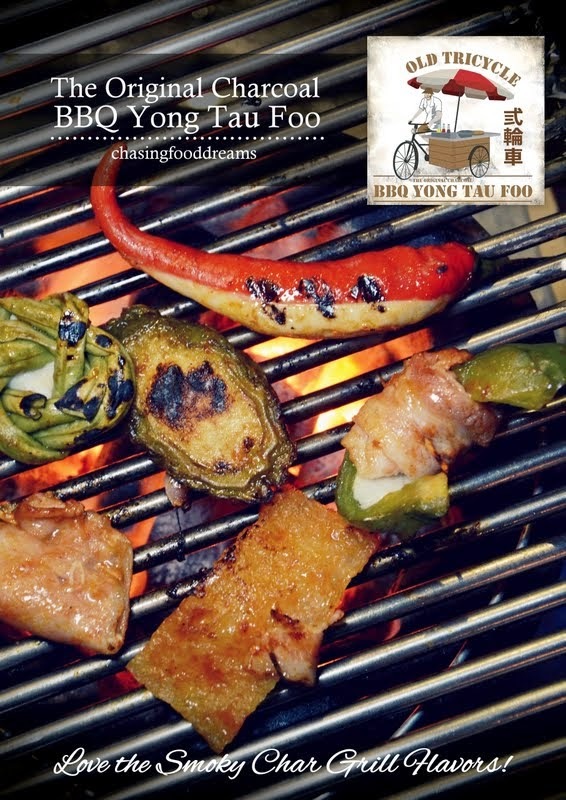 Ray decided it was time to amp up the flavors of his dad’s recipe to another level by grilling the yong tau foo. Choi Yen and some of us headed over one evening for a taste at Old Tricycle Yong Tau Foo. 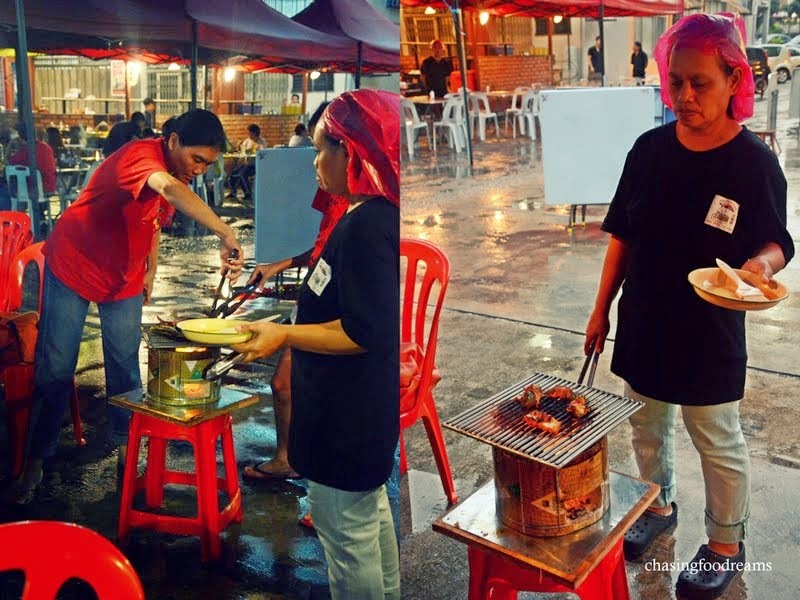 The open air street café was not difficult to locate for those who knows where the famous Japanese BBQ in Taman Desa is as Old Tricycle Yong Tau Foo is located right next to it. Plastic tables and chairs are spread all over the back alley a la alfresco. If there is rain, tents are placed over the tables. At a glance, the food is prepared in a small shop lot corner. A bright lite signage denotes that one has arrived at the street café. The night we were there, a light drizzle of rain provided a cool note to the ambience. We saw pots of charcoals being fired up outside the shop. Tables were almost filled up and some staff was busy scurrying around with plates of food and also helping out on the individual charcoal grills as well. What stole the attention and is probably a must photo op is a 3D mural of Ray’s father selling yong tau foo on his tricycle stall! Ok… by now, this photo would have been splashed all over the World Wide Web but I would not do justice if I do not add my addition of this beautifully painted mural in this post. We adored the concept of using old serving wares at Old Tricycle Yong Tau Foo. There is just something so wonderfully beautiful when old memories are brought back to life. Our drinks were served in steel painted mugs just like those good old days. These mugs are so popular back then and were usually coated with enamel. The ones used here are now mostly used in weddings, hence the wedding design and colors. We had lovely cold mugs of Kumquat (Honey Lime), Fuzhuk Barley and Cincau with Basil Seeds to quench our thirst that night. The drinks are refreshing and perfect for the BBQ fare. Drinks are priced at RM4.50 each. Dishes were brought out quickly on a weaved-bamboo serving tray. The dishware is also the enamel kind that was used back in the olden days. We practically had their whole menu while soft crooning of nostalgia songs are play throughout the night. The experience really brought those good old days where life was basic and simple. Enjoying a simple meal outside where the world was more innocent and less complicated was much missed and will always be appreciated. Our tray of goodies had a large platter of assorted yong tau foo pieces that are coated with some sauce. This is a set order where one can try a little of everything on their menu. Alongside the yong tau foo is a smaller plate of fried fuzhuk or stuffed bean curd sheets with sweet dark sauce and chili sauce. Old Tricycle Yong Tau Foo currently offers eggplant, bittergourd, chili, lady fingers, beancurd, long beans, tau foo pok, capsicum, pig skin, bacon, beancurd sheet and meatball. We rolled up our sleeves and got busy with some grilling actions. The hot coals sizzle and smoke raises up to the air as we placed the pieces of yong tau foo on the grill. Soon after, a light smoky aroma permeates through the air and had us lusting after it excitedly. A staff came by and brushes some oil on the pieces to avoid it from sticking and help us out with the grilling action. The pieces that were ready cooked never made it to a plate for our photos because we polished it off as soon as it was ready. I was particularly fond of the capsicum stuffed with fish paste and wrapped with bacon and the stuffed bacon roll. These really stood out in maximum flavors. A little sweet, a little savory and juicy in each bite, we had to reorder these. The rest was great too with the added smoky grilled flavors and the sauce on the yong tau foo was lightly sweet so it caramelized beautifully. Between the six of us, we walloped countless pieces of the yong tau foo after reordering twice. Though the fried stuffed beancurd was already yummy when it was served, we were told that a light toast on the grill would make this even better. And it did, the fried beancurd sheets are addictive but one really needs to keep an eagle eye on it on the grill because it burns quite easily. There are 3 sizes of set menu with small set of 15 pieces YTF for 2-3 pax (RM 30.00), medium set of 25 pieces YTF for 4 pax (RM 48.00) & large set of 35 pieces YTF for 5 pax (RM 65.00). A la carte is also available in case one only likes certain types of YTF. A la carte pieces start from RM1.80 onwards. While waiting for the yong tau foo to be grilled, we devoured plates of signature Chee Cheong Fun laced with different sauces. Old Tricycle offers 4 sauces from Soy Sauce & Fried Onion to Sweet Sauce & Dried Shrimp, Curry Sauce with Pig Skin & Dried Shrimp and Curry Sauce with Sambal with a price tag of RM3.50 onwards depending on the sauce. It was a unanimous decision that we all really enjoyed the Curry Sauce with the Sambal. Though we went back home smoky and sweaty, our appetites were thoroughly satisfied. Old Tricycle Yong Tau Foo proves to be a classic dish turn new age done well. Simple food made well gets extra points in my books. The place gets filled up early so head over as early as you can for dinner. Make sure to order their stuffed bacon for extra satisfaction! Looks really good, would want to try. I love my yong tofu in clear soup too.